For nearly 6,000 years, pronghorn have made an annual migration from their summer range around the highlands of Grand Teton National Park to their wintering grounds, located about 170 miles south in the sagebrush-covered Upper Green River Valley near the town of Pinedale, Wyoming. But today, land development, large-scale energy enterprises, fences and roads are jeopardizing the ability of the animals to continue their traditional way of life. The route the pronghorn take—one of the longest terrestrial mammal migrations in North America and the longest left in the Greater Yellowstone Ecosystem—is known as the Path of the Pronghorn. It became the first federally designated wildlife corridor in the United States on May 31, 2008. Unfortunately, U.S. Highway 191 cuts across that course in a very narrow and dangerous spot just west of Pinedale. Along a 12-mile stretch of road here, an average of 140 pronghorn and mule deer are killed each year. In October 2012, a new, highway-crossing structure was built to help lessen the toll on the ungulates. The question, however, was: would the pronghorn be able to negotiate the newly designed overpass? The stakes were high; if the pronghorn balked, one of the West’s most iconic species could vanish forever from one of our most scenic national parks. Watch the eight-minute video below, produced by NineCaribou Productions for the Wildlife Conservation Society. 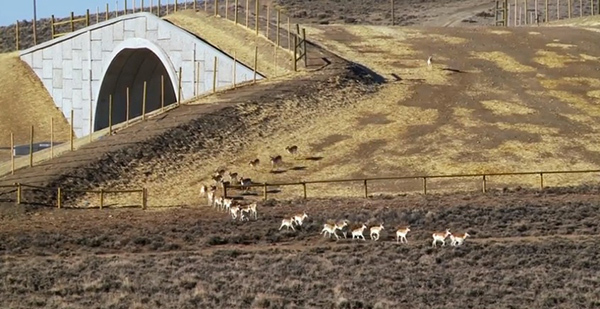 Discover what happened when the first group of pronghorn encountered the new overpass. Thank you for sharing this, Candice. I’ll be forwarding the link to this video as well as the link to your site to friends keenly interested in preserving wildlife. This is very encouraging! While our organization has not yet engaged in such a project, I can envision doing so at some point in the future. Nice work! I have had a strong interest in wildlife corridors for a few years now and it’s always great to see one actually built. There are so many areas in the U.S. that needs these, but the funds seem to always be absent. Always a pity to see species that survived the Clovis and Folsom cultures smashed on the side of the road by supposedly “advanced” people of the current age. Glad to see this corridor protected. FINALLY! Someone’s finally thinking of what the wildlife need! Now if we’d only smarten up to begin with & build smarter so that we don’t 1st desecrate wildlife migration routes to the point where we then have to come up w overpasses 2 rectify our mistakes, needlessly upsetting & killing already endangered wildlife! Great Post. We have several groups in SC working on conservation projects. Orvis has done a few big ones. Thanks again. Any help from the WCS or others in terms of support or suggestions. The highway overpass is cool and should be a standard part of highway design (it is used extensively in places like the UK as well). If we can find a way to consider wildlife in all our development, we’ll all live better and healthier lives. Unfortunately, fracking, oil pipelines, natural gas and oil drilling are a threat to human health and habitat as well as to that of wildlife. Let preserving wildlife habitat and way of life help humans to find a healthier path of our own everywhere we make development and resource exploitation choices.They are our canaries in the coal mine. Great video! I would love to analyze the pronghorn movement with our TrackLab software. If WCS is interested in that, I would like to get in touch. This is spectacular!. It may encourage greater advocacy for similar exercise elsewhere. Thanks for sharing it. I wish this project becomes an example of corridors protection. The fragmentation and disappearence of the habitat are the main threats for wildlife survival. Pretty cool indeed-hopefully we will see a trend in such a concept and more will be built. This is so awesome , Wish you could get BLM to look at this and figure out how to leave the wild horses to their own destiny with a new route , instead of unnecessary roundups. Thank you for sharing, Candice. It’s wonderful to see that this is working.